Now that I’m a real grown up I have to look like I know what I’m doing, look like I’m capable, at work. Theoretically I could pay someone to take my nice shirts away and iron them into fancy-flatness for me. But, um, I’d feel guilty doing that and it would take time to arrange. There’s something very sobering about cleaning my own apartment and ironing my own shirts. It feels like I should do it, to keep my feet on the ground and all things ‘looking after yourself’ in ‘perspective. The only thing I don’t understand is why I have to iron 10 shirts every 7 days. Something is clearly going wrong here. 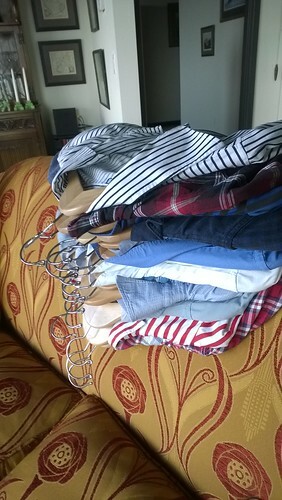 My socks are not vanishing, I don’t wear 2 outfits a day, how come my pile of ironing breeds…..
Nice shirts Wendy? Hell yeah! I love a good crisp shirt with cufflinks in the morning! This scribble was published on Thursday, July 16th, 2015. You can follow any banter on this scribble with the RSS 2.0 feed. You can share your inspired musings after typing the anti spam word near the bottom of the page. But no Pinging because its too naughty. I wish I would find extra clothes, even if I did have to iron it.